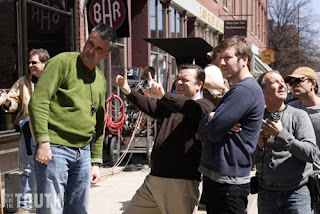 Ricky Gervais, the British comedian that brought us the original "The Office," is in Lowell filming a new movie called "This Side of the Truth." They're filming in Lowell, and according to IMDB, it's a pretty awesome cast: Jonah Hill, Rob Lowe, Jennifer Garner, Jason Bateman, Tina Fey, Ricky Gervais, Louis CK, and so on (here). My girlfriend Jane and I went to dinner with Christopher Guest last night. We went to arguably the best restaurant in Boston, L'Espalier. It is very posh but luckily serves chicken (I don't like things that are still bleeding or have too many legs or live in shells). Click (here) to read his blog. Please don't stop reading mine (even tho his is funnier). 1 Response to "This Side of the Truth Filming In Lowell"